My favorite part of The Summer Camp Society is the sharing of ideas. I love getting to hear about the ideas that folks have tried, what has worked, and hasn’t. Every camp is different, but we all have so much in common. Why reinvent the wheel? You can see more about that journey at Camping Coast to Coast. Each week when we meet for The Summer Camp Society I keep a document open, Ideas for 2018, and I add new ideas from other folks or new ideas that are sparked from conversation. Most participants do something similar. I love it. Not all these ideas are going to work and a some of them I won’t get a chance to implement this year, but if just a couple of them turn into hits than I will feel great about it. As we developed the program we started something called “Somebody’s Something”. The idea is similar to a Mastermind Group or Consultative Problem Solving. One person is on the hotseat. They explain a problem, project, or idea they have, and we all try to help. It’s an awesome exercise both for the person getting specific advice and for all the rest of us thinking about similar problems we might have. I can’t wait to get back into Somebody’s Something groups. I have never been on the hotseat and the takeaways have still been out of this world. Over the next few weeks I am going to try to write up a bunch of the ideas we are hoping to try. This one is all about staff ideas. Next fall I’ll try to give you the feedback on how they went. We are calling it Try Things Camp. As a camp community we have so much to learn from each other. I hope some of these ideas resonate with you and maybe inspire you to find a community to share ideas with. Kurtz inspired this one. We hire a lot of new staff and, like most of you, spend a ton of time during staff orientation on teambuilding and skills development to help our team be as prepared as possible for the summer. We also have extensive interviews and pre summer conversations between Laura and I and all the staff. Last year we had a seasonal leadership team member call each new staff and welcome them to camp, and it was pretty good. This year we are doubling down on welcoming staff early and often. We are paying one of our seasonal leadership staff members, Klee, to develop a preseason welcoming plan. Klee is dividing all the staff up into groups of about 8 that will have meetings on Zoom each month starting in April. Your Zoom group, lead by a seasonal leadership staff member, will stay the same throughout the preseason and into staff orientation. We already have groups about that size that meet each night during staff orientation so these Zoom groups will continue through that. Maybe we will do meet ups each week in the summer. The hope is that, by starting to build small communities before getting to camp, new folks can get more comfortable more quickly with our larger community and have a chance to ask questions, make jokes, and be more of themselves when they arrive. Klee is developing a curriculum for the preseason meetings, but mostly it will be simple conversations and get to know you activities. Kurtz shared this idea from her time at Ann Arbor YMCA. The idea is super simple. What if we put aside a specific amount of our programming budget for the staff to use? Let’s say we had $1000. Any staff could put together a quick proposal and get access to some of that money to improve camp. It could be starting an outdoor cooking program, putting twinkle lights up in the shower house, or a million other ideas we haven’t thought of yet. In the past, we have just encouraged folks to let us know when they need things or have an idea, but what I love about this program is it gives less vocal staff a specific way to make lasting impact at camp. I wrote about this in the summer camp pros group on FB. The bones of this idea I dreamed up with Carlie, from the Takodah YMCA. We were talking about training staff to work in adventure playgrounds and other camper driven play spaces, during a one on one. This got me thinking, how we can better support our staff through their different roles as camp counselors? 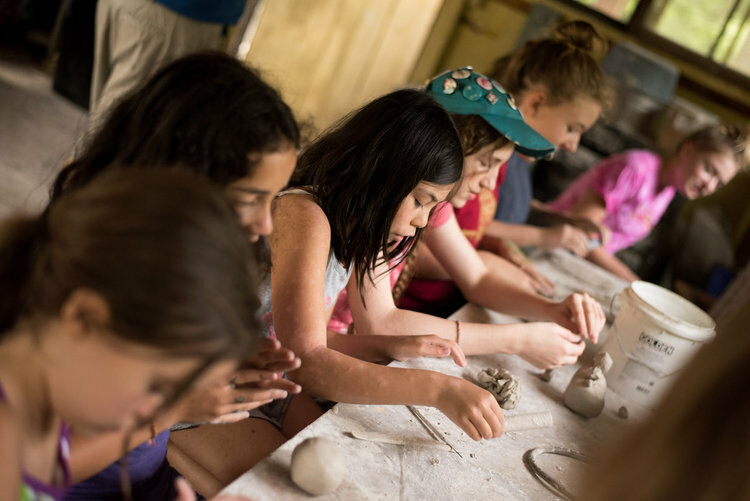 Almost no one task of being a camp counselor is super difficult, but the hard part, the real art, is knowing how to mix between a leader, a follower, and the many other facets of our work at camp. We wrote up this quick synopsis of 7 Roles of a Camp Counselor as an intro. My guess is we will use these terms this summer and simplify this as the summer goes on. The hope is that by codifying the different roles we can better support staff if they are struggling to help kids through tough times, lead activities, remember to help kids find their toothbrushes. Instead of looking at each one of those as separate issues thinking “What role of counseling aren’t you quite getting if you can’t remember the toothbrush? And how can we help you in that space?” That would be being a caretaker and it probably means we can get better at a number of other aspects of caretaking as well. On top of this, it gives us some simple brainstorming or skits to create during staff orientation. I can imagine breaking our staff up into the 7 groups and asking them to think through scenarios at camp where each role is applicable. Then, what can go wrong if we neglect different roles or use different roles in the wrong situations. Maybe each group dreams up scenarios and writes them on index cards. Then groups pulls a card with the scenario, and they suggest what roles might be the most effective in that scenario. Maybe! Level two is pulling a scenario card and a role card, then acting out what/how that role would look in the scenario. It could be really silly and lead to some great debrief discussions. I thought of this one week as Luke, from Beacon Bible Camp, was explaining his process for bringing volunteers to camp. I know at least YMCA Camp Seymour and Camp Augusta have their own versions of this, but we never did. In a further attempt to help welcome new staff into our community, we built a very simple page on our website to help them see a little more about what they are opting into. It includes a video encouraging them “Don’t take this if…”, a video from staff orientation, and some articles to read about our take on working with kids at camp. Now, we send to it all staff after we offer them a job and before they accept. This one I learned from Jason Smith at YMCA Camp Kitaki. Often, at camp, people have rough days and other folks want to help or I just want to say thank you in a meaningful way, but we don’t totally know how. At Kitaki, they have their staff all fill out a quick one page questionnaire during staff orientation asking how someone could make their day. Then they put a copy of all those pages in a binder where all the staff can access them. Now, when you want to thank someone or give them a quick pick me up, you can check the book and know exactly what they have asked for. Why guess if they would prefer chocolate or a handwritten note? It is kind of like bringing the Love Languages to life at summer camp. Thanks for spending a few minutes deep inside my brain with me! I am excited to keep digging into different ideas and sharing. If you have cool staff ideas that you want to share I would love to read them in the comments or if you want to get together and dream up ideas with us, check out The Summer Camp Society program!